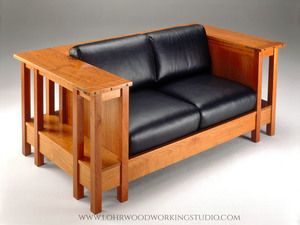 The challenge for the sofa and loveseat was to create a design that was capable of fulfilling most of the functional furniture requirements for a comfortable living space in a single piece of furniture. The design had to have just the right amount of detail and interest to elegantly define an architectural style and yet be equally at home in both formal and informal settings. The multi-functional nature of the piece provides space for interesting displays around an inviting and comfortable sofa that is built into a table. This extraordinary piece can be dismantled for move-in through difficult entryways.